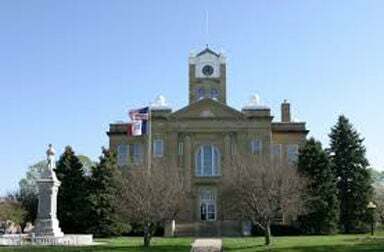 The Monroe County Board of Supervisors approved the five-year construction plan that the Secondary Roads Department will file with the Iowa Department of Transportation. County Engineer Jeremiah Selby said the plan he was showing the supervisors did not include the exact gravel roads that would be rocked each of the five years with approximately $500,000 of rock. Year 1, 2020, the two bridges spanning the Union Pacific and the Burlington Northern railroads on the Avery Road would be dealt with at a cost of about $3 million. The McGee Bridge on 730th Avenue is rated at three tons and will be replaced. Built in 1956 it is a “pony truss” bridge and was ordered closed by the IDOT in 2014. The cost is between $400,000 and $500,000. Year 2, 2021, the Reed Bridge near Cargill will be replaced at a cost of $700,000 and the Hiteman Road will be sealed at a cost of between $150,000 and $200,000 using Farm to Market and state funding. In Year 3, 2022, a bridge north of Hiteman will be replaced at a cost of $600,000. In Year 4, preservation work will be done on S-70 (Melrose to Lake Rathbun) at a cost of between $100,000-$150,000. The McDanel Bridge on the main road between Moravia and Blakesburg is on the schedule for replacement at a cost of $600,000. In Year 5, a bridge north and west of Highway (M-19) will be replaced at a cost of $600,000. Selby briefly discussed efforts to spend local tax dollars on parts of Old Highways 34 and 5, along with the Airport Road and the Avery Road. The board heard the Pioneer Cemetery Commission yearly report that included uncovering two new Pioneer Cemeteries Manley Cemetery and the Foutch Cemetery. Auditor Amanda Harlan went over the Hunt and Associates independent audit which showed a basically clean audit. The board accepted the audit and voted to offer Hunt a three-year contract for future independent audits. The board also passed a resolution opposing Senate Study Bill 1045 and Senate File 184, being pushed by the Iowa forestry industry that would allow forestry vehicles up to 130,000 pounds on county roads with IDOT permitting. Current the load limits are 80,000 pounds with board of supervisor’s permission. County Engineer Selby said the legislation would force the county to rate all of their bridges at significant cost. He and supervisors said a forestry truck this spring already tore up a farm to market gravel road.